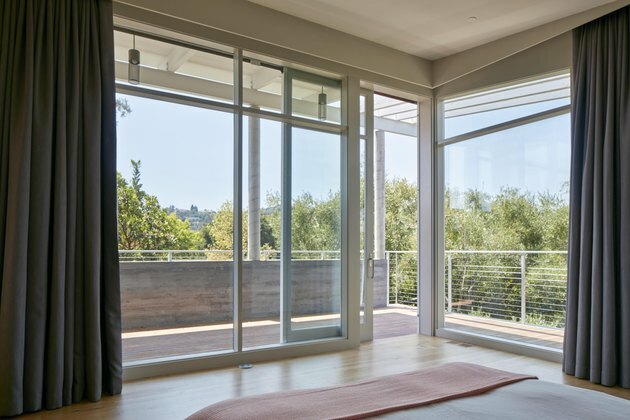 Silicon Valley is known for "disruption," but not necessarily for tranquility. So when a technology investor and a psychotherapist set out to create a home in the area, they imagined it as an amalgam: a peaceful retreat where their family would be removed from the digital noise. 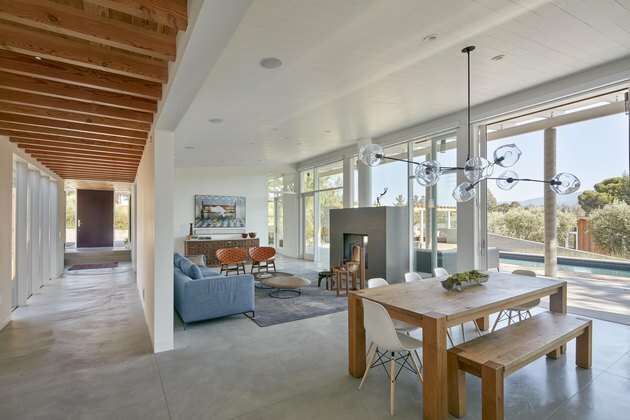 "The clients wanted a very California house: one that was simple, warm, and modern," explained architect Malcolm Davis. "Therefore, strong indoor-outdoor connections and sustainability were important factors." The couple chose a site that was once an old farmhouse, but years of renovations had stripped it of its character. The first step, then, involved dismantling the structure and repurposing the salvaged materials in the construction of the new address. Once that was complete, Davis devised an H-shaped layout that would maximize sunlight and create a connection to the towering redwoods and oak trees beyond the proposed frame. "Another important design move was preserving a 100-year-old, above-ground concrete cistern, a remnant of the site's agrarian history," Davis said. "The house subtly refers to the cistern with concrete elements, including a generous staircase that gracefully connects the courtyard to the pool deck." It's a tranquil place, indeed, and one that feels more connected to the natural world than to the plugged-in one. 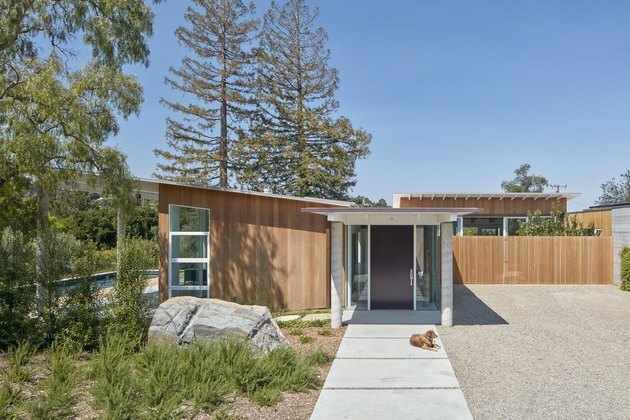 Architecture firm Bernard Trainor + Associates created the drought-resistant landscaping around the exterior's cedar siding. Cedar elements were used throughout the property, providing a warm contrast to the concrete features. 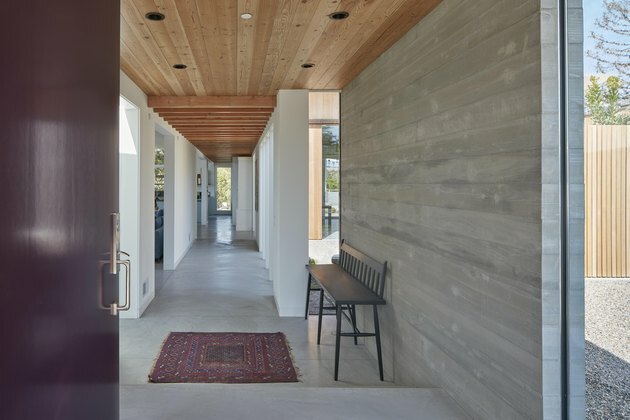 The entrance hall is distinguished by a wall of board-formed concrete, which matches the smooth flooring. A Togo sectional by Ligne Roset and a rug by Stark Carpet create a cozy spot for hanging out in the family room. A pendant light from Lindsey Adelman's Branching series is suspended over the dining table. 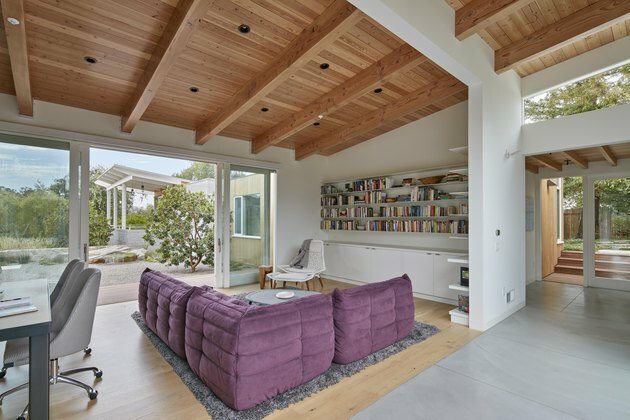 The living area features an Antonio Citterio sofa from B&B Italia, Pebble coffee tables by Ligne Roset, and a rug from Dzine. The kitchen is outfitted with custom cabinetry and Caesarstone countertops. 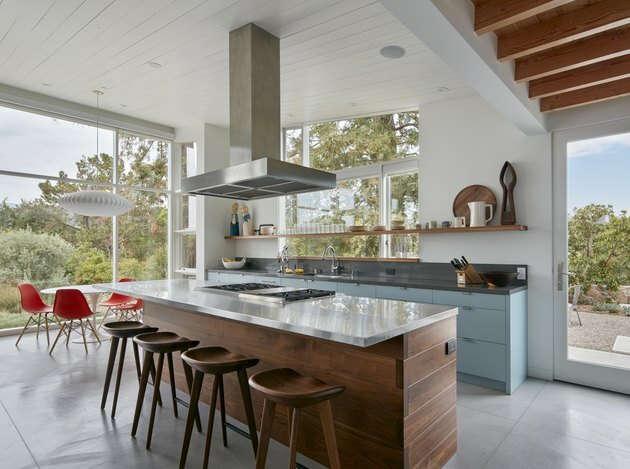 The stainless steel–topped island is paired with Tractor bar stools by Craig Bassam from Design Within Reach. 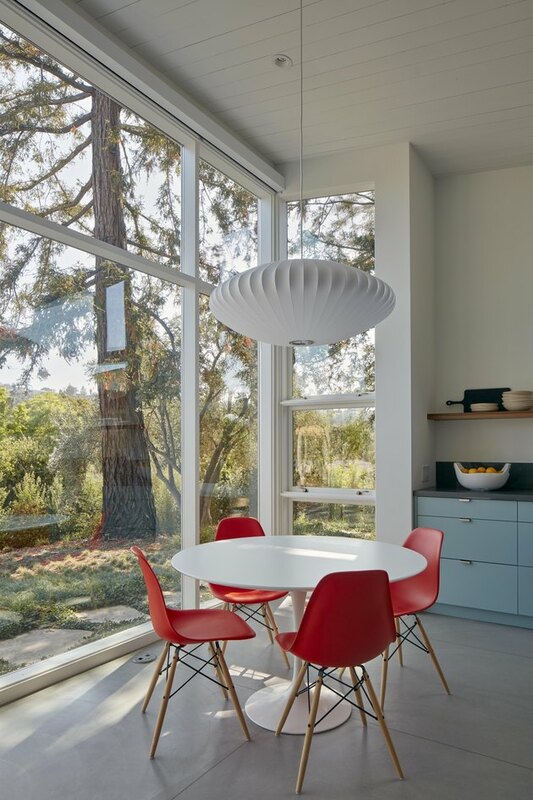 A George Nelson pendant light illuminates a Eero Saarinen table and Eames chairs in the breakfast area. 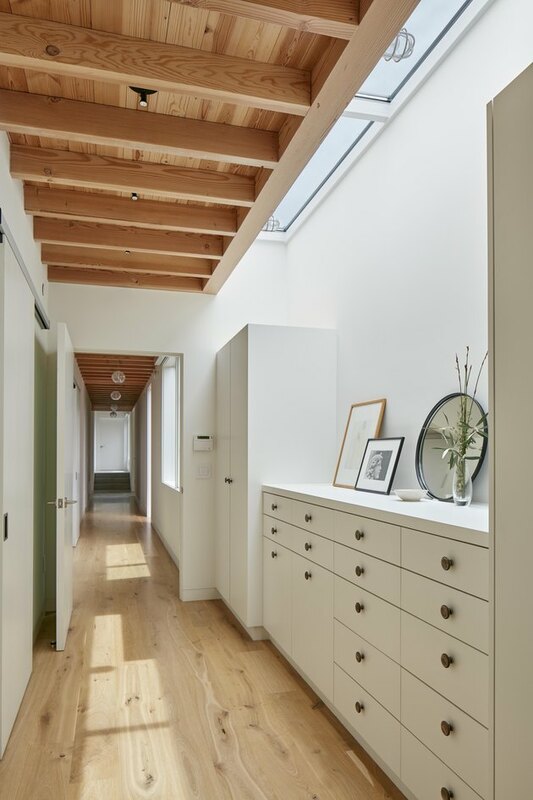 A dressing area with custom built-in cabinetry leads to the master suite. And once inside, the master bedroom leads onto its own terrace. 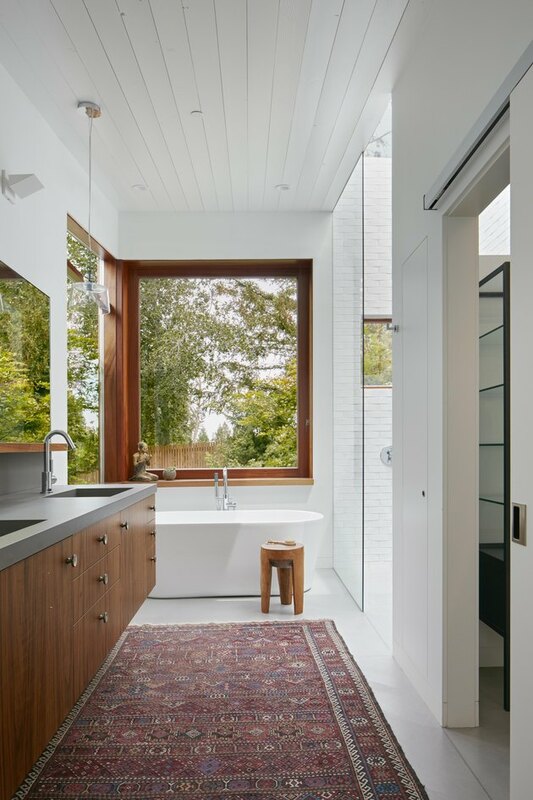 The master bathroom features a soaking tub, shower, and a custom vanity. The living room's double-sided fireplace can also be enjoyed on the porch. The pool is surrounded by an ipe wood deck that will age over time.